The Royal Chambers playset encourages kids to play out scenes in a place where Elsa takes a break from royal duties. Designed to look like Elsa's cozy bedroom, this 2-story playset encourages kids to imagine all sorts of amazing adventures. Flip the window to reveal 2 different scenes -- one, a frosted window, the other, an Arendelle village scene. 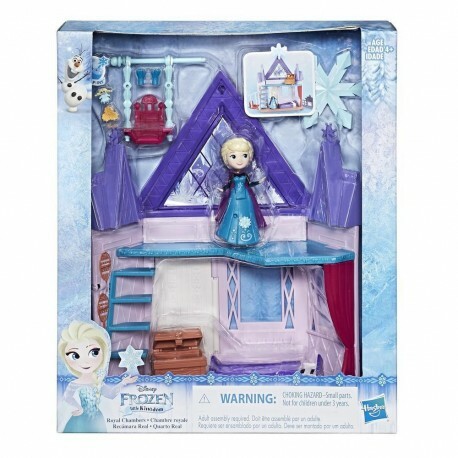 Set also includes a chest that holds a pair of gloves, a cape for Elsa, and 3 Snap-ins pieces. 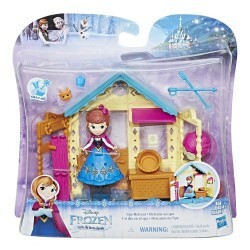 The playset connects to the Ice Garden Gazebo and Spa Retreat sets so kids can build out their Frozen world! Each set sold separately. • Includes doll, cape, playset (4 pieces), gloves, 3 Snap-ins pieces, and 2 accessories.